After reading Jessi Leigh Swenson’s op-ed, posted in full below, we invited her to share her story here because it so beautifully illustrates this point. Some people have abortions because they aren’t ready to parent and then go on to have children. Nearly 60% of all people seeking abortion care already have children and decide to have an abortion so they are able to take care of the children they already have. Sharing our stories is a powerful way to educate people about the realities of women’s experiences and show our policymakers the impact their decisions have for Maine people. We are so grateful to women like Jessi who are working to implement policies that support women’s health and reproductive rights at the national level. Best wishes to Jessi as she prepares to welcome her first child! I am a proud Maine girl: hardworking, strong morals and family values, laid back, and happier in a flannel than a blouse. And this Maine girl is happy to share that I am six months pregnant with a planned, wanted pregnancy. I am in a wonderful, supportive relationship with an amazing man. Both of us achieved our educational dreams. We have good jobs and are financially secure. We are ready to be the parents we want to be. We have health insurance and work for employers committed to helping workers balance work and family. I am lucky to be having the beautiful pregnancy experience that all women and families deserve. Like so many Maine girls, I would not be where I am today if it weren’t for many years of hard work, living through lean times and making ends meet. I worked multiple jobs through high school to save money for college, and then continued that hard work into law school — even house cleaning and gardening, when times were spare. And I would not be where I am today if I had been denied access to abortion when I needed it. As a senior at Hampden Academy, my future was laid out ahead of me. I’d been accepted to college with a scholarship, as I’d always dreamed. I was going to study and become a writer, a lawyer or a teacher. Who knew what I could become? And then one day I realized my period was over a week late. Time froze. 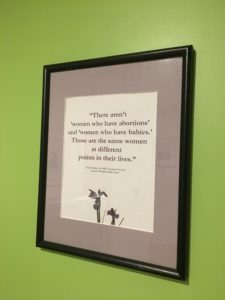 I called Mabel Wadsworth Center in Bangor, my voice shaking, and asked about how much an abortion was. I asked about how one might set up an appointment. I thought about my hard-earned savings account and checked the balance. I thought about my college acceptance letter. As it turned out, I wasn’t pregnant. But that moment is etched in my mind as a potential turning point that so many young women in Maine have faced or will face. I later experienced an unintended pregnancy at another turning point in my life. I was in my mid-20s and was about to start studying for the LSAT in addition to my multiple jobs. I knew abortion was the right decision for me, and I was lucky to scrape the money together and get the care I needed. Two years later, I started law school. In either of these situations, if I had been denied access to abortion, my ability to start a family as I am now — with all the supports I need to keep myself and my family strong — would have been jeopardized. Picture this in a different light. Picture your friend, daughter, neighbor or classmate facing an unintended pregnancy at a similar time in their life. Picture them having their sights on a secure future for themselves and their family, no matter what that looks like for them. Now picture Brett Kavanaugh on the Supreme Court. Kavanaugh passes President Donald Trump’s litmus test. This means that if confirmed, Kavanaugh would undo Roe v. Wade’s protection of legal abortion. Beyond Trump’s promise to appoint justices who would overturn Roe, Kavanaugh went out of his way last year to praise former Chief Justice William Rehnquist’s dissent in Roe. Kavanaugh also recently voted to prevent a young immigrant woman from accessing the abortion care she wanted, arguing for a delay in her release that could have made it too late for her to legally access abortion. If Roe is overturned, people like me will be denied the ability to choose when and whether to parent. They may be forced into parenthood before they are ready and defer their dreams, and they are more likely to descend into or remain in poverty. I share my story because sometimes it seems like this Supreme Court seat is all about political talking points and legal mumbo jumbo, but I know my fellow Mainers see through that. Really this Supreme Court fight is about people’s ability to live and parent on their terms. The stakes are high, and they are right in front of you — Maine girls like your neighbors, daughters, nieces, cousins, classmates. Their lives will be impacted by a Kavanaugh confirmation. I urge you to speak out, and tell Sen. Susan Collins that for her and for all the other current and future Maine girls, she must vote no. Jessi Leigh Swenson, a Hampden native, is senior policy counsel at the National Partnership for Women & Families and lives in Arlington, Virginia. This op-ed was originally published by the Bangor Daily News on July 26, 2018.